Since you spend one-third of your life sleeping, investing in the best pillow for back sleepers seems like a no-brainer. But with the number of options on the market, finding the perfect place to rest your head can take a little research. Fortunately for you, we’ve done all of the legwork for you. 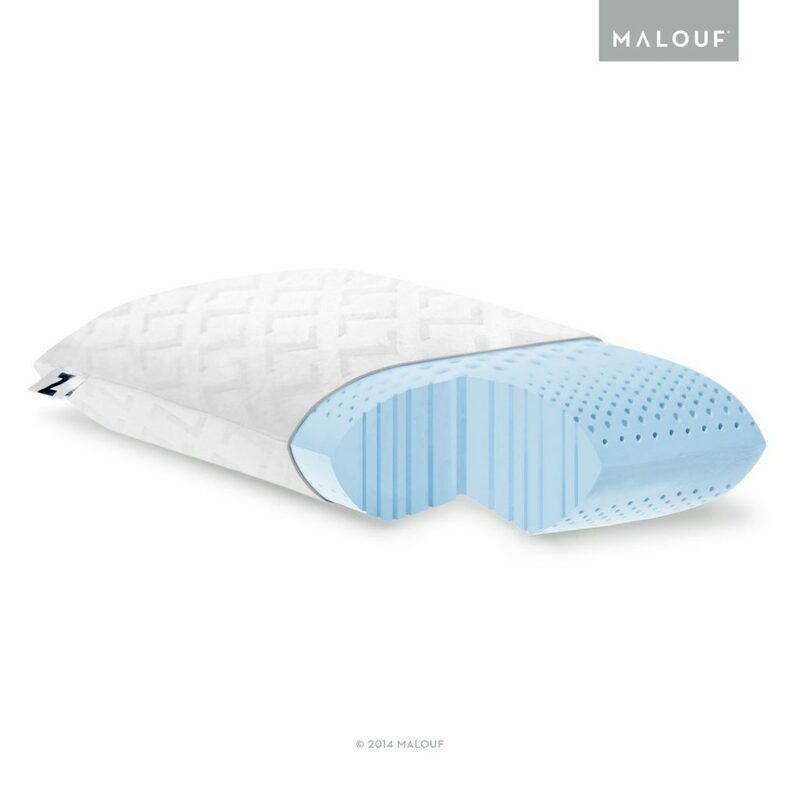 We came across the Malouf Z Zoned Gel Dough gel-infused memory foam pillow, which is designed with back sleepers in mind. This pillow not only works well for back sleepers, but it’s also one of the best pillows for stomach sleepers as well because it offers the right blend of neck support, durability, and comfort. A back sleeper will need a high loft, firm pillow that features divots for the neck and head and provides the type of spine alignment that’s necessary for a comfortable night’s sleep. You’ll need a pillow that is much firmer, so the head isn’t able to go back too far. This contoured pillow works to take on the shape underneath the neck, providing the perfect amount of support. The manufacturer uses patented gel dough memory foam and zoned technology in order to create the perfect sleep combination of support and comfort. This type of technology utilizes pin cores that are designed to cradle the head while also providing support to the shoulders and neck. Basically, this pillow offers two comfort zones. The middle of the pillow features larger holes which allow the head to sink into the pillow, providing optimal comfort. The outside of the pillow features smaller holes in order to align the spine and support the neck. These holes also promote increased airflow so you’ll sleep cooler at night. One of the most important factors that can affect the quality of your sleep is the thickness of the pillow. Normally, to test whether or not the pillow offers the correct amount of thickness, you would need to stand parallel to a wall with your back touching and your neck straight. There should be a gap between the back of your head and the wall. This will show you the ideal thickness you need. The manufacturer has designed a pillow that’s specifically designed for back sleepers, so you’ll enjoy the perfect amount of thickness so the pillow won’t cause neck strain or cramping as you sleep. Quick Tip: If a pillow is too firm it can cause neck stiffness, which is why most people who sleep on their backs prefer a pillow that offers a medium firmness. The gel dough technology in this gel infused pillow provides the exact level of firmness you need through a combination of support and give. The pillow’s malleability refers to the ease in which the pillow conforms to the contours of the head and neck. A malleable pillow will conform to the shape of the head and neck, and easily hold its shape in order to prevent any unnecessary strain on the neck. This model features a combination of gel and memory foam, providing support to both areas while promoting proper alignment of the spine and neck. In general, memory foam pillows are a long-lasting option that has a reputation for conforming to the head, offering a customized fit. They offer great support, especially for people who suffer from neck and shoulder pain. Yet, while most models of memory foam pillows don’t breathe well, the divot design works to minimize this problem, keeping you cool and comfortable as you sleep. The pillow is available in three sizes: queen, king, and standard. It’s also available in three styles: high loft, low loft, and mid loft. Choosing the proper loft is crucial to achieving the right support. Using a pillow with a loft that’s too thin or thick can result in uneven pressure placed on the face or head and poor neck alignment. Not to mention breathing difficulties, pain, and discomfort. To choose the right loft style you’ll need to consider several factors such as overall body size, weight, head size and sleep position. Pros: The gel technology also works to create a cooler, softer and doughier foam. As we mentioned, the pillows divot design paired with zoned technology offers exceptional airflow, making it one of the most breathable, coolest pillows on the market. This pillow is topped with a breathable bamboo rayon velour cover. This material is perfect for temperature regulating fabric. The cover is also removable and machine washable. The pillow’s open cell divot construction also helps to increase the pillow’s overall durability. This model comes with a five-year product warranty that protects the cover and pillow from manufacturer defects. The manufacturer uses a unique memory foam dough formula which is what makes this pillow so distinctive, allowing it to stand out from the crowd. The memory foam formula used is designed to improve the foam’s contouring capabilities, while also preventing it from flattening out over time. This popular memory foam pillow is soft enough to feel snuggly but firm enough to provide the right amount of support.If you frequently change positions during the night this pillow is able to quickly return to its normal shape. Cons: Because of the gel-infused design, this model is not machine washable, which can be a deal breaker for some consumers. The Tempur-Contour Side-to-side Breeze Tempur-Pedic pillow is a better option if you’re also prone to sleeping on your side. This model works well for most sleeping positions because of its ability to bounce back quickly and the dough memory foam design that provides the right amount of give. A pillow that truly has it all, you’ll love how this pillow keeps you cool while allowing you to rest easy at night. The cooling technology, size and style options, and gel infused dough design work together to offer the ultimate memory foam pillow. Offered at a reasonable price, this Malouf pillow received plenty of positive consumer feedback, with a score of five out of five stars.